Monica works in a variety of Mediums; western paper, contemporary quilting, beading, sculpture, drawing, collage & surface design. A bird house is a great way to entice wild birds to your property. You can choose from a wide variety, providing shelter and a safe environment for baby chicks to grow. "Vincent Made Me Do It"
There are numerous kinds of domesticated parrots and exotic birds. 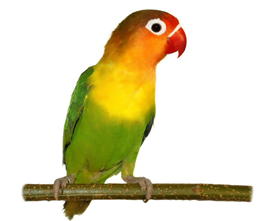 We offer a wide selection of healthy birds from cockatoos and African Greys to finches. Birds like to rest on perches, climb limbs, and play with ropes. You will find a wide assortment of durable and safe rests and swings perfect for your bird to tussle with and relax on. Using a mix of food and feeders, you can enjoy the company of wild birds on your property. The best part is, they keep your yard tidy while adding to the serenity of your home. 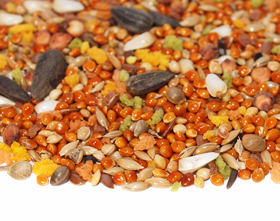 Providing your bird with the right dietary mix is important. Our shop carries a range of fortified natural seed, fruit, pellet, and nut mixes that will keep your bird in peak health. It is important to provide a secure and spacious environment for your birds. 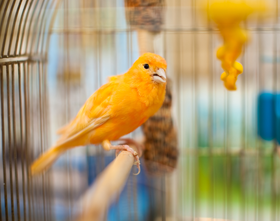 At DEMO inc, we offer custom and standard cages of all kinds for birds of all sizes and types.